In the early 70’s, Faith Baptist Church began as a desire in the heart of Pastor Allan Flint of Fellowship Baptist Church in Warsaw to see a fundamental Baptist Church in North Manchester. He approached Gail and Bertha Grossnickle, who lived in North Manchester, about leading the start of a new church. After prayerful consideration, they felt God’s leading in this endeavor and a Bible Study was started on Wednesday evenings in the Grossnickle’s basement.The Bible Studies continued until they felt a larger meeting place and more extended services were needed.. The group rented the Pizza King restaurant, 602 W. Main, in North Manchester for Sunday services. Pastor Robert Dyer, Sr., Calvary Baptist Church, Wabash, held the morning worship services. Bill Plough, Jr. conducted the evening services. During the early years a variety of facilities were rented. As further evidence of the direction and blessing of the Lord, in November, 1976, a gift of 4.18 acres of land, where the Church buildings are located, was given to the Church by an anonymous donor, unaffiliated with the Church, but aware of the need. A building fund was started as the Church looked to establish a permanent meeting place. In 1979, Faith Baptist was able to purchase a modular building from Immanuel Baptist Church of Fort Wayne. Services began to be held in the new building on September 30, 1979. Faith Baptist now had a permanent home. In April, 1980 dedication services were held with Roy Clark, Immanuel Baptist Church; David Jeremiah, Blackhawk Baptist Church; Robert Dyer, Baptist Bible College representative; and Lee Kantenwein, Grace Theological Seminary as the speakers. These Services greatly blessed the membership and visitors. .
At the same time Faith Baptist became a self-supporting local church. 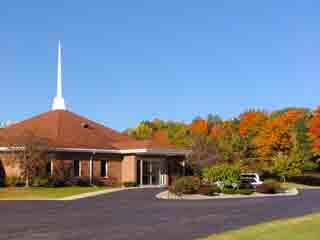 Faith Baptist had been supported as a missionary work to this point by Fellowship Baptist, Warsaw; Calvary Baptist, Wabash; First Baptist, Mentone; Calvary Baptist, LaPaz; Hillcrest Baptist, Logansport; First Baptist, Argos; Bible Baptist, Huntington; Hillcrest Baptist, Rochester; and Bible Baptist, Auburn. Beginning in June of 1986 we witnessed the construction of our present auditorium and fellowship hall facilities. The real blessing was watching God provide the finances to pay for the new buildings completely. Starting in 1981 through the completion of the building, $442,600 was given for the construction of the new building. We only had to pay for the remaining portion of the mortgage on the original modular buildings. In 1993 a major financial goal was reached when the Church was able to pay off the remaining mortgage on the first units. In December, the final payment was made to Indiana Lawrence Bank. Our God is amazing! Early in 1987 we found ourselves busy painting and other finishing details of the new buildings. We held our first service in the new building on February 8th. The dedication services were held February 20-22. In April we began remodeling the previous auditorium into classrooms. As we have quickly looked back over the past of Faith Baptist Church, we have to realize that we serve a great and gracious God. God is good. In the ongoing years, we have continued striving to reach our community for Christ. We would like you to fellowship with us.